Portland, Oregon. Sustainability might not seem glamourous, but Portland is making a name for itself as one of the most sustainable cities in the world. Whether you’ve heard about the farmers’ markets, the cycle-friendly streets or the ongoing efforts to balance livability and equity, Portland is leading the way in urban sustainability: this book helps us understand how it achieves this.A critical component of Portland’s success is collaboration between different communities and institutions; the Sustainable Solutions series examines higher education’s role in these partnerships. 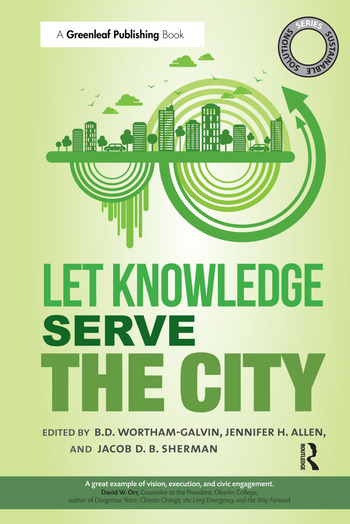 In exploring how best to “let knowledge serve the city”, Portland State University translates its founding motto from mere words to applied research and action.This first volume examines different approaches to collaborative work that PSU has taken, both within the university and with community partners: how have barriers been overcome between different areas of study, between academia and the public, and why is bridging these divides so important? It also introduces the themes of the engaged university, social justice, climate change and sustainable economic development, which shape PSU’s work.Let Knowledge Serve the City is ideal for anyone seeking best practice in connecting students and universities with the needs of local communities. From public interest design and student leadership, to food justice and age-friendly development, authors combine academically rigorous theories of sustainability and community-university partnerships with lessons learned on how to realize ideals of sustainable development.